Most coffee shops in Delhi, where I live, have ‘iced tea’ on the menu. They all sound inviting—Berry Blast, Peach Bliss etc. But each time they arrive, I feel a tinge of disappointment—they are cooling and refreshing, no doubt, but lack the nutritional and real-fruit punch one craves. Fruity iced teas are a breeze to make at home. I have some power-packed recipes that live up to their names! Pineapple and Ginger Bliss: Chop up pineapple—enough to fill a small bowl. Bring it to a boil in 1 cup of water, and take off the heat. Add a lemon or orange herb tea bag and some fresh ginger shavings. Steep the ‘tea’ for a couple of minutes, then strain. Add cold water, a few ice cubes and the reserved pineapple bits. Energizing Apple Tea : Boil a small bowlful of chopped up apple in 1 big cup of water with a cinnamon stick. Remove and add a white tea bag. Pour 1 cup of cold water on the tea and some no-sugar-added orange or apple juice. Garnish with a sprig of mint, and sip. The enzymes in white tea have been shown to reverse sagging skin and spirits. And you get your day’s apple, too! Peach Paradise: Use the same recipe as above. 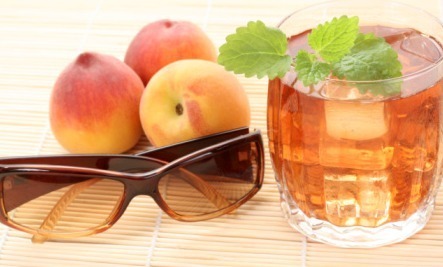 Peaches work well with black tea, but you could use a nice flavored herbal tea such as orange or raspberry. The amino acids in green tea bring quick relief from stress. Peaches soothe your nerves, and their sweet, juicy taste takes you to paradise! Melony Cooler: Follow the same method as above, but use a bag of green tea, and add a few sprigs of fresh mint and some coconut shavings. Green tea is a fabulous metabolism booster, and melons hydrate you beautifully. Both contain antioxidants to make you feel fresh and happy in a jiffy. Of course you can play with different fruits and flavors of tea here, and be assured of delicious and healthy results most of the time. So, sip away and have a fresh and happy day! Came back for another look at the delightful photograph, just love tea.